You can add your active CAA membership number to your SHOP.CA account personal account information. 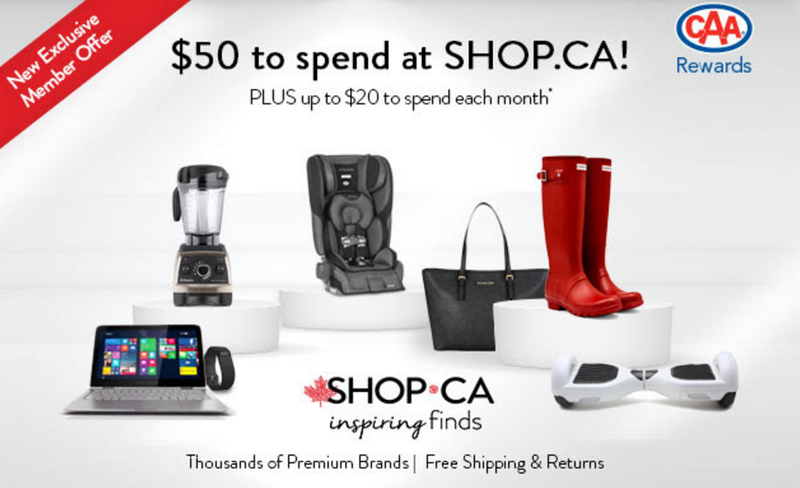 Browse SHOP.CA’s extensive selection of premium products and brands. When you’re ready to pay, proceed to checkout, and enter “CAA” in the promo code field. By doing this, you can receive your one-time $50 discount off your first purchase of $100 or more before Dec 31, 2015. CAA Members also receive a $10 discount off a purchase of $50 twice a month. Simply enter "CAA" in the promo code field at checkout up to two times each calendar month to receive your $10 discount. Note: you must first redeem the offer of $50 off of $100 before you're eligible to receive the monthly discounts. First Purchase Discount and Monthly Discount cannot be combined together or with other offers such as other promo codes, third party cash back discounts, etc. Limit one Monthly Discount per order.